Objective: To evaluate the clinical and radiological response of chronic calcific tendinitis of the shoulder to extracorporeal shock wave therapy (ESWT) in a single blind study. Methods: 70 patients showing chronic, symptomatic, calcifying tendinitis of the shoulder were examined. A single blind randomised study was performed with 35 patients undergoing a regular treatment (group 1) and 35 a simulated one (group 2). Pain and functional assessment was carried out according to Constant and Murley. Variations in the dimension of the calcification were evaluated by anteroposterior x ray films. Results: A significant decrease of pain and a significant increase in shoulder function was seen in group 1. Examination by x ray showed partial resorption of the calcium deposits in 40% of cases and complete resorption in 31% of cases in group 1. In the control group no significant decrease of pain and no significant increase in shoulder function was seen. No modifications were observed by x ray examination. Conclusion: Because of its good tolerance, safety, and clinical radiological response, ESWT can be considered as an alternative treatment for chronic calcific tendinitis of the shoulder. The prevalence of calcification in the rotator cuff is reported to be between 2% and 20% in asymptomatic shoulder joints. The reported prevalence in patients with shoulder pain is up to 50%.1–3 The disorder is most common among people between 30 and 60 years of age. The methods of treatment usually adopted include physiotherapy, analgesic and non-steroidal anti-inflammatory drugs, local x ray treatment, steroid injections, needling,4 and surgical intervention. Extracorporeal shock wave therapy (ESWT) is based on the use of shock waves, pressure impulses with a duration of microseconds, capable of producing, depending on the energy used at the level of the areas treated, a reduction of painful symptomatology and fragmentation of calcific deposits. We aimed at determining the efficacy of ESWT in a single blind study for chronic calcific tendinitis of the shoulder. 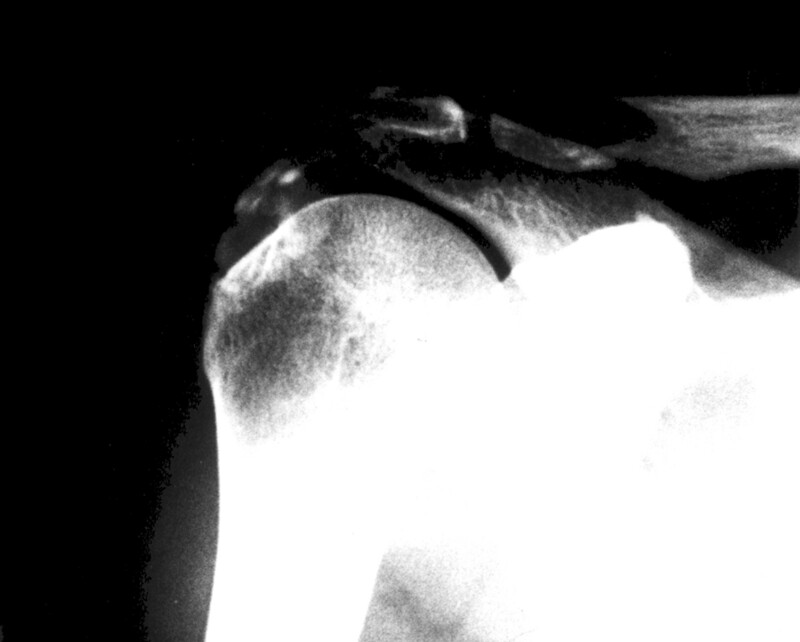 Seventy patients (43 women, 27 men) aged between 35 and 68 years, with a mean age of 51.8 years, showing chronic, symptomatic, calcifying tendinitis of the shoulder were examined. Inclusion criteria were shoulder pain present for a minimum of 10 months (a period of time that is useful for indicating a chronic pathology that is resistant to other treatments) in combination with calcification of the rotator cuff (with a minimum diameter of 10 mm in anteroposterior x ray films), and unsuccessful conservative treatment during the six months before referral to our hospital. In all patients, the calcific deposits were non-homogeneous. According to sonography all calcifications were located in the supraspinatus tendon. The exclusion criteria were local and generalised arthritis (excluded by bio-humoral, clinical, radiological, and sonographic examination), osteoarthritis, algodystrophy, pregnancy, infectious or tumorous diseases, skin ulcerations, neurological abnormalities, dysfunction in the neck or thoracic region or both, and partial or complete ruptures of the rotator cuff seen by sonography. All patients had used analgesics and non-steroidal anti-inflammatory drugs, 25 patients from group 1 and 28 patients from group 2 had received local steroid injections, 10 patients from group 1 and seven patients from group 2 had undergone physiotherapy, two patients from group 1 and three patients from group 2 had undergone needling. The patients examined had painful symptoms for at least 10 months and all had undergone physiotherapy during the initial phases of their pathology, with disappointing results. During the six months before ESWT, analgesics and non-steroidal anti-inflammatory drugs or local steroid injections were carried out and only a small percentage of patients continued physiotherapy. All patients were informed of and consented to the treatment methods. No other treatment or drugs were used during the four weeks before the trials began or during the study period. During the periods of treatment and follow up the patients were instructed to use the arm but to avoid painful movements. Consecutive patients were randomly assigned to one of two groups in a single blind study. The patients were unaware of the type of treatment (active or sham), whereas the evaluators were aware of the type of treatments. Group 1 received ESWT: 35 patients (20 women, 15 men), mean duration of symptoms 15 months (range 10–20 months). Group 2 was the sham group: 35 patients (23 women, 12 men), mean duration of symptoms 14.5 months (range 10–18 months). An ESWT system was used (“Orthima” by Direx Medical System Ltd). In group 1 the treatment comprised four treatments (one every 4–7 days), each treatment consisting of 1200 shocks with a frequency of 120 shocks a minute. Because pain could occur mostly during the first treatment all patients were treated with a low energy density of 0.03 mJ/mm2 for the first five minutes, which was then progressively increased to 0.28 mJ/mm2. In successive treatments an energy density of 0.28 mJ/mm2 was used. In group 2 the treatment also comprised four treatments (one every 4–7 days), each treatment consisting of 1200 shocks with a frequency of 120 shocks per minute, but the energy density used was 0 mJ/mm2. The patients were seated in front of the shock wave generator and the shock wave source was placed in the direction of the calcification that was identified during sonographic examination. No local anaesthetics, analgesics, or non-steroidal anti-inflammatory drugs were used during the procedure. Pain and functional assessment were carried out according to Constant and Murley,5 at baseline, at the end of the treatment, and one and six months after the end of the treatment. Subjective parameters were pain (15 points) and activities of daily living (work, recreation/sport, unaffected sleep: 10 points; positioning: 10 points). Objective parameters were range of motion (forward elevation, lateral elevation, internal rotation, external rotation: 10 points each) and power (25 points). A maximum of 100 points could be attained. Variations in the dimension of the calcification were evaluated by anteroposterior x ray films at baseline and one month after the end of the treatment. The single radiologist who carried out the study was always the same, was aware of the radiographic orders but was not aware of the type of treatment being given (active or sham) to the patients; modification of the calcification (a reduction of size of >2 mm) was indicated as disintegration; the total disappearance was indicated as dissolution. The non-parametric Mann-Whitney test for independent samples was applied to compare differences between the two groups. The non-parametric Wilcoxon test for dependent samples was applied to compare differences within the group. The mean value of the Constant score in group 1 was 45 points (pain 5.2, activities of daily living 9.6, range of motion 23.2, power 7) at the start of the study. At the end of the treatment there was a mean increase of 58% to 71 points (pain 9.8, p<0.001; activities of daily living 13, p<0.001; range of motion 32, p<0.001; power 16.2, p<0.001) (p<0.001). One month later there was a mean increase from baseline of 64% to 74 points (pain 10.4, p<0.001; activities of daily living 14, p<0.001; range of motion 33.6, p<0.001; power 16, p<0.001) (p<0.001). After six months there was a mean increase of 69% to 76 points (pain 12, p<0.001; activities of daily living 14.6, p<0.001; range of motion 34, p<0.001; power 15.4, p<0.001) (p<0.001) (fig 1). Mean Constant score before extracorporeal shock wave treatment (ESWT), after ESWT, and one and six months later. *p<0.001, group 1 v group 2; †p<0.001 group 1, baseline v after ESWT, after one month, and after six months. The mean total shoulder function for patients in group 2 was 48 points (range 22–84 points) at the start of the study. At the end of the treatment the mean was 50 points (range 26–82 points) (p not significant). One month later the mean was 46 points (range 20–70) (p not significant). After six months 23 patients of group 2 left the study, and in the 12 patients remaining the mean was 44 points (range 20–76) (p not significant) (fig 1). Apart from a self limiting initial pain lasting for a few minutes the patients did not experience any adverse reactions such as worsening of symptoms or relapses of acute periarthritis. In group 1 one month after the end of the treatment partial resorption of the calcium deposits was seen in 14 (40%) patients and complete resorption was seen in 11 (31%) patients. Radiological disintegration or dissolution of the calcification was significant in group 1 (p<0.001). In group 2 the calcium deposits remained unmodified (figs 2 and 3). 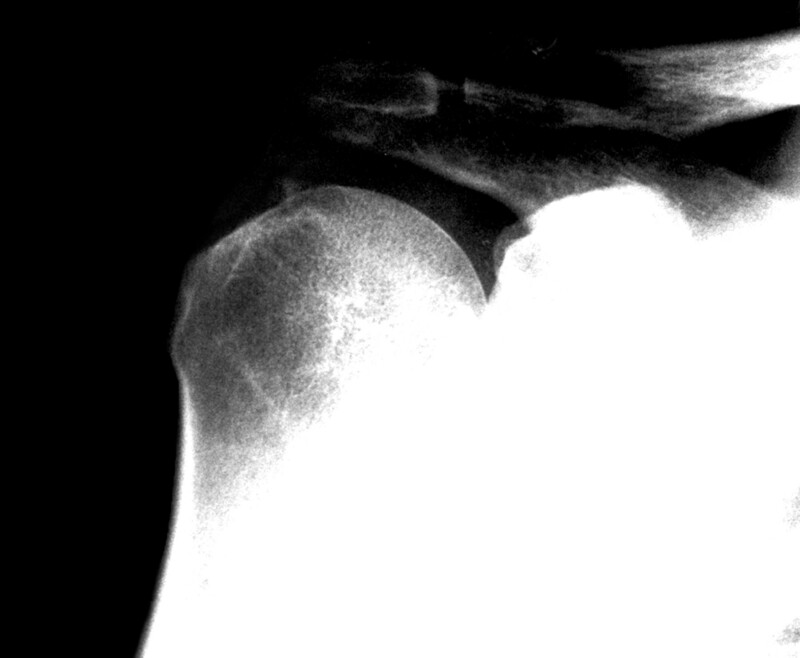 Radiograph of the shoulder before ESWT. The same patient as in fig 2 one month after the end of the treatment. High energy extracorporeal shock waves have been used in urology for the disintegration of stone concretions for almost 15 years. Valchanou and Michailov6 and Schleberger and Senge7 introduced high energy shock wave treatment in the treatment of pseudoarthrosis and delayed union of fractures. Since 1992, low energy extracorporeal shock waves have been used in the treatment of pain, in particular of enthesopathy. In our single blind randomised study we evaluated the efficacy of ESWT in chronic calcific tendinitis of the shoulder and we also evaluated the placebo effect: one group of patients underwent treatment whereas in the other group treatment was simulated. 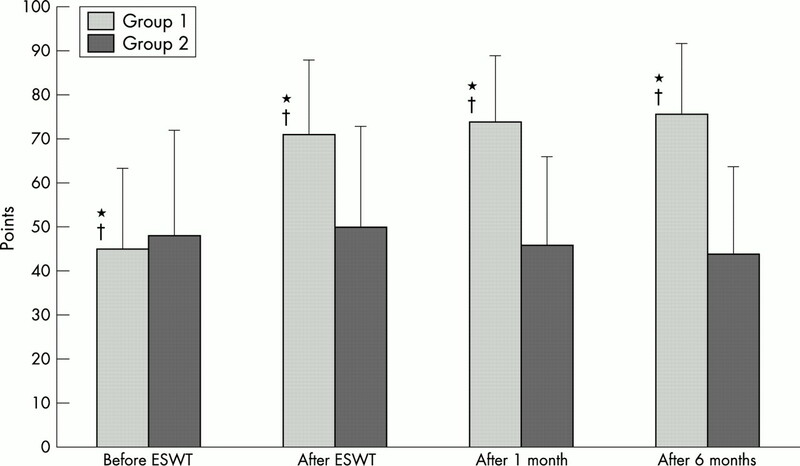 In group 1 ESWT effectively reduced painful symptomatology and increased the shoulder function. This was also the case in patients in whom the calcium deposits remained unmodified, confirming that the presence of calcium deposits does not always correlate with clinical symptoms.2,3 The results seen at the conclusion of the treatment were maintained over the following six months. In 40% of cases partial resorption, and in 31% of cases complete resorption, of the calcium deposit was seen. In the control group, no significant changes in pain levels, in shoulder function, or in the dimension of the calcium deposit were seen. With its good tolerance, safety, and clinical-radiological response, ESWT should be considered as an alternative treatment for chronic calcific tendinitis of the shoulder refractory to conventional treatments. Duplay S. De la peri-arthrite scapulo-humerale et des raideurs de l’epaule qui en sont la consequence. Arch Gen Med1872;20:513–42. Basworth B. Calcium deposits in the shoulder and subacromial bursitis: a survey of 12,122 shoulders. JAMA1941;116:2477–89. De Palma A, Kruper J. Long-term study of shoulder joints afflicted with and treated for calcific tendinitis. Clin Orthop1961;20:61–72. Quigley T. The non operative treatment of symptomatic calcareous deposits in the shoulder. Surg Clin North Am1963;43:1495–9. Constant CR, Murley AHG. A clinical method of functional assessment of the shoulder. Clin Orthop1987;214:160–4. Valchanou VD, Michailov P. High energy shock waves in the treatment of delayed and non-union of fractures. Int Orthop1991;15:181–4. Schleberger R, Senge T. Non-invasive treatment of long bone pseudarthrosis by shock waves (ESWT). Arch Orthop Trauma Surg1992;111:224–7. Rompe JD, Hope C, Kullmer K, Heine J, Burger R. Analgesic effect of extracorporeal shock wave therapy on chronic tennis elbow. J Bone Joint Surg Br1996;78:233–7. Cosentino R, Falsetti P, Manca S, De Stefano R, Frati E, Frediani B, et al. Efficacy of extracorporeal shock wave therapy on the treatment of calcaneal enthesophytosis. Ann Rheum Dis2001;60:1064–7. Rompe JD, Rumler F, Hopf C, Nafe B, Heine J. Extracorporeal shock wave therapy for calcifying tendinitis of the shoulder. Clin Orthop1995;321:196–201. Rompe JD, Zoellner J, Nafe B. Shock wave therapy versus conventional surgery in the treatment of calcifying tendinitis of the shoulder. Clin Orthop2001;387:72–82. Loew M, Jurgowski W, Mau HC. Treatment of calcifying tendinitis of rotator cuff by extracorporeal shockwaves: a preliminary report. J Shoulder Elbow Surg1995;4:101–6. Loew M, Daeke W, Kusnierczac D, Rahmanzadeh M, Ewerbeck V. Shock-wave therapy is effective for chronic calcifying tendinitis of the shoulder. J Bone Joint Surg Br1999;81:863–7. Seil R, Rupp S, Hammer DS, Ensslin S, Gebhardt T, Kohn D. Extracorporeal shock wave therapy in tendinosis calcarea rotator cuff: comparison of different treatment protocols. Z Orthop1999;137:310–15. Spindler A, Berman A, Lucero F, Braier M. Extracorporeal shock wave treatment for chronic calcific tendonitis of the shoulder. J Rheumatol1998;25:1161–3.